Not with these squares! I’m telling you guys, this project is my favorite ever, and I have not gotten sick of working on this project even for a second. I’m the queen of WIPs because I get bored with projects. This one? Heck no! This is my go to project for months now and I always enjoy working on it. If you’re following me on Instagram, you have surely seen these gorgeous granny squares littering my feed. They’re so colorful and simple at the same time. Each square is so vibrant, unique, and somehow still screams simplicity! I’ve since become a fan of circle grannies since I made my Woodland Afghan, and have come up with a smaller sized granny square to show case each little pop of color in the middle. How am I making each and every square so completely unique? The secret to these babies are really in the yarn. 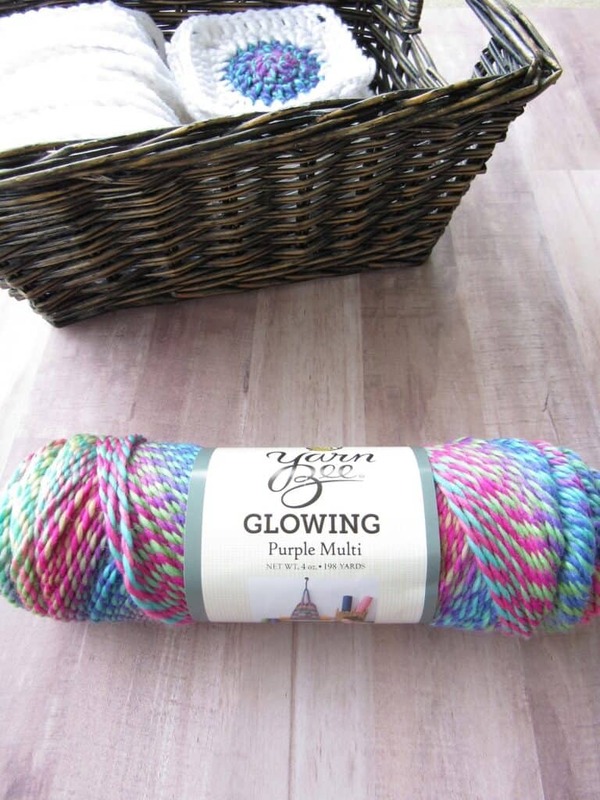 I initially picked up this Yarn Bee Glowing in Purple-Multi at Hobby Lobby for my amigurumi unicorn pattern (you can check that out here). I had lots of yarn left to play with and I knew I wanted to use it with a solid white to give it good contrast. Out came these granny squares and I haven’t stopped since! Literally. I am still making these squares between other projects in order to make it into an afghan. Each square is totally different and making each granny square is like magic. First you start with the circle where each and every circle is packed with beautiful color and no two are alike. Then you add the white and somehow it totally transforms into something more beautiful! They’re small and easy to work on anywhere. Even outside in the dead of summer. 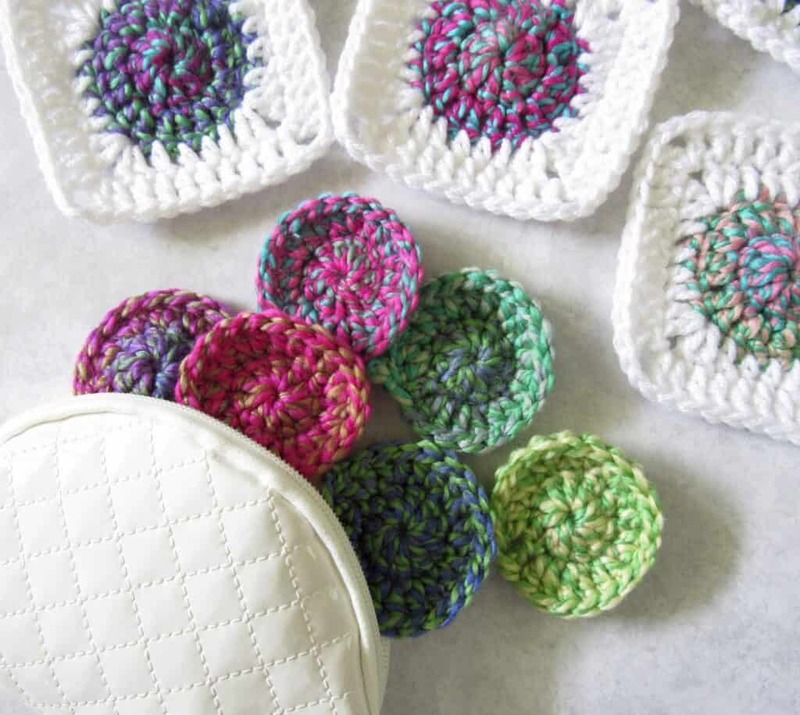 Granny squares in general are great to work on in the warmer months because they’re so small and you never have anything draped over your lap. And the best thing? They’re so stinkin’ easy and quick! I make the circles in bulk and then I work on the white boarder to make them in a square. In total, there are only 4 rounds. Since I know there will be hundreds of these babies, I am also weaving in the ends in batches. I do not want to save them for the end! Gauge- Each square I have made is 4inches x 4 inches. I tend to crochet fairly loose, you may need to go up a hook size. If you don’t have access to a Hobby Lobby to purchase the Yarn Bee, look around at your craft stores for other variegated yarns! Round 4: Chain 2, *DC until you get to chain 2 space from previous round. [DC, chain 2, DC] into chain 2 space from previous round. Repeat from * three more times. DC in next two spaces, join to first DC or the round. Fasten off. 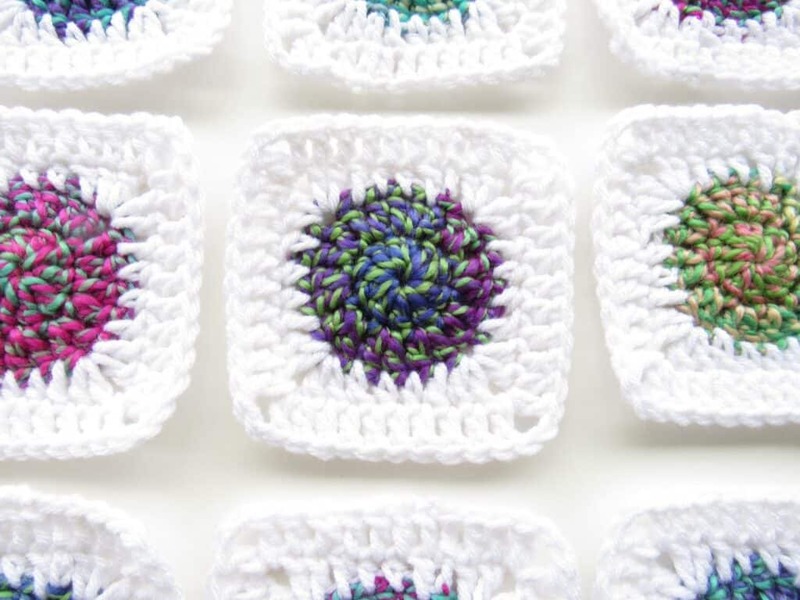 You may want to block your granny squares to get them stretched out and flat before you join all the squares together. If you don’t have a blocking board, you can use kids foam mats (the interlocking puzzle piece mats), a garden knee cushion, or anything you can stick a few skewers into. 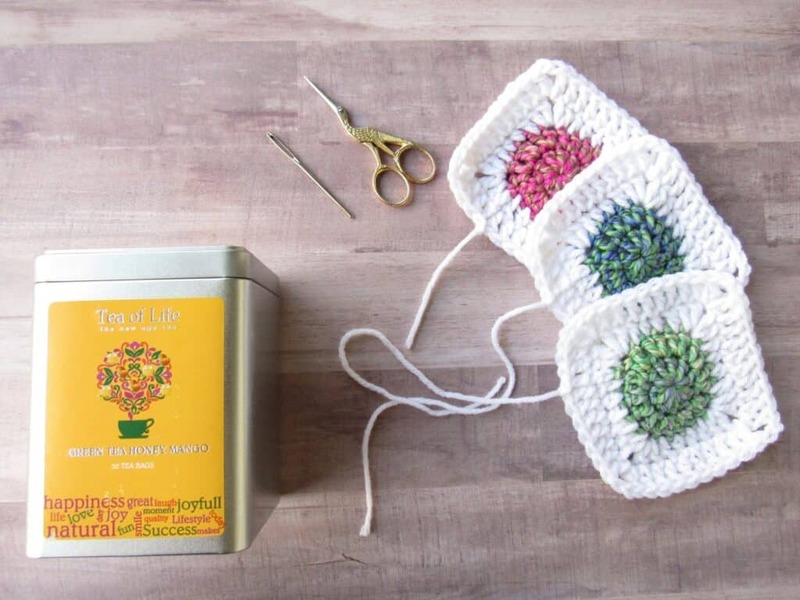 All you will need to do is have 4 skewers or small dowels and insert them into what ever you are using as the base and slide on the granny squares. Keep this pattern handy by saving to your Pinterest boards! Do you measure from corner to corner? I am enjoying making this blanket and I'm looking forward to seeing the finished product. I just wish there was a stitch count at the end of each round. Any idea yet as to how much yarn the blanket requires? Oh yay! I found it on YouTube! Thank you, Maria, for your response to the yarn requirements. If I may pester you one more time, can you tell me how big your throw turned out to be? Thank you so much!